A tribal/modern aztec themed 1st party for our little wild ONE year old girl! My design inspiration came from the venue we wanted! The giant teepee made it easy to decide that I wanted it to be a modern aztec meets tribal theme! The colors really directed this party! I love fun, modern, geometric, yet whimsical! Smash Cake & Topper: Friend made it for me. The little topper has a sweet meaning! I saved that from my Baby Shower cake in her room all year just for this party! My sweet friends spent some time cutting out those letters. So happy I got to bring it out once more! Cupcake Toppers: Crafted by Mom (Ashley) thanks to using a borrowed Silhouette Cameo. I am ready to purchase my own now. I am obsessed with it! Food: Costco for the win! One thing that I was really proud of myself for was having a healthy spread of food for out guests! Most of our friends feed their kiddos healthy foods, so other than the standard treats, I wanted to make sure lunch was full of healthy options! We opted for grilled chicken strips, the Sweet Kale Salad, Green Salad, Fruit, Cheese cubes, pita chips, naan, hummus, carrot sticks (and ranch), and apple sauce pouches. We had hardly any kale salad left over!! Crafts: One thing I really wanted to be sure to have was something for the older kiddos! So I decided to create a yarn crafting station. I left no directions. Just sticks, pre-cut yarn, popsicle sticks, and showed the girls how to start a God's eye. We had quite a few kiddos ranging from 0-12, so the older girls eyes got wide when I showed them the craft station. Activities: One word BUBBLES. The bubble machine was a huge hit (and disaster waiting to happen with cement floors--oh well. no one died). I also had tattoos available for the kiddos to put on. Thanks to one of my friend's, there was an adult there to help. Love when other step up and love on kids at parties! Decor: I crafted almost all of it! I did get a little (LOT) of help sewing the triangle garland (which got tangled RIGHT as the party was starting...oh well). 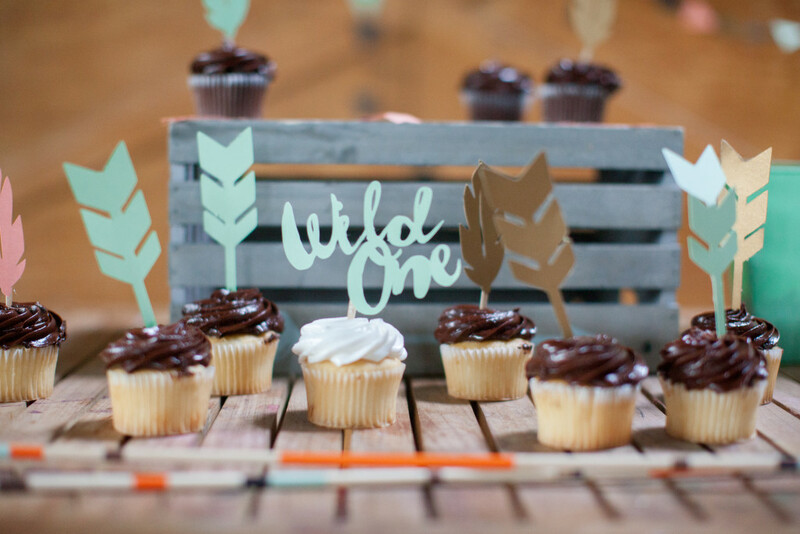 My favorite items were the cupcake toppers! I just had so much fun making those! I was worried that I wouldn't have enough decor to fill up the table, and the feathers & arrows really helped make the table look festive! Start planning early! Hunt the target dollar spot (which is where I found those black and white triangle buckets)! And don't be afraid to cut back on the details! Sometime's less is more. I had grand plans of making super cute decorated royal icing cookies, but I ran out of time and steam. Choose your colors and know that if you want specific colors, paper source is the BEST place to get your supplies. I'm a photographer and graphic designer. So this party was such a fun outlet! Hire a photographer! I didn't shoot these photos (maybe a few, because I just had to) and it was great to just enjoy the party!